Keith Curle believes people shouldn't be scared of change' as he reshapes and rebuilds the Cobblers squad. With just three days of the transfer window remaining, Curle has still to make a permanent signing as Town boss, with the three incomings to date all loan players in George Cox, Joe Powell and Timi Elsnik. 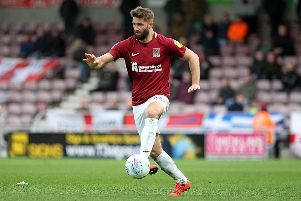 Five players have left the club though, including Kevin van Veen and Matt Crooks, and the Town manager hinted that one or two more old faces could be on the way as well as he strives to put his own stamp on the Cobblers squad he took over following Dean Austin's sacking in September. Curle, who says he is working hard to bring in new players, has always said he will also be happy to let players leave if the deal is right for the club and the player. And asked about rumours circulating regarding one or two of the Town squad not involved at the weekend, he said: "It is always a moving picture, and there will always be rumours at this time of year. "The players know if they hear rumours, if they are part of the rumours, come and see me and I will tell them the truth. "But we are in an industry where you shouldn't be scared of change. "Sometimes, if players aren't getting game time here, they might have to take an opportunity to take a journey somewhere else. "Nobody has to fall out about it, it is part and parcel of the game and the nature of the industry we are in. "We are building, we are having a look at the youth players and giving them the experience." Youth team graduate Jay Williams is just 18 and has become a first team regular since the turn of the year, while in the 1-1 draw with Morecambe on Saturday, another 18-year-old in Morgan Roberts played and impressed in the final 15 minutes. Teenagers Camron McWilliams and Scott Pollock were both on the bench as well. Curle has spoken of the team needing more experienced players, but he also says he won't be afraid to throw youngsters into the fray if he feels the time is right. "There is nothing better for youth players than coming in, joining us, and playing games," said the Cobblers boss. "I am brave enough to put them in, and say 'come and learn on the frontline, because this is where it all happens'. "It is good to see the vibrancy and the willingness of the youth to learn, to adapt, and to accept the challenges that come out of playing men's football, playing League football, and it is excellent for the football club. "I don't know how many debuts I have given in the past 20 games, but it is a few. "That is new players, young players coming into the squad, and they are finding out a lot about the structure and also the DNA of the football club, which is vitally important."